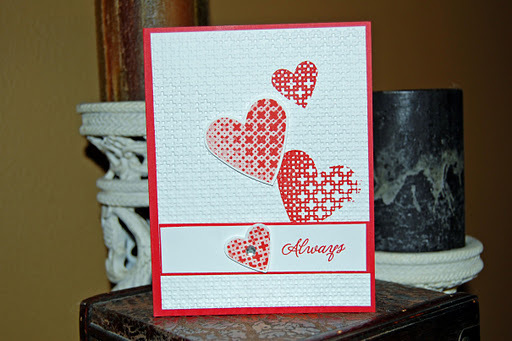 Some of you may have seen this new technique on Maureen’s blog, Hideaway, when she posted a linky in response to a recent sketch challenge. When we saw it we knew everyone would want to give it a try, and Maureen was sweet enough to put this tutorial together for us! 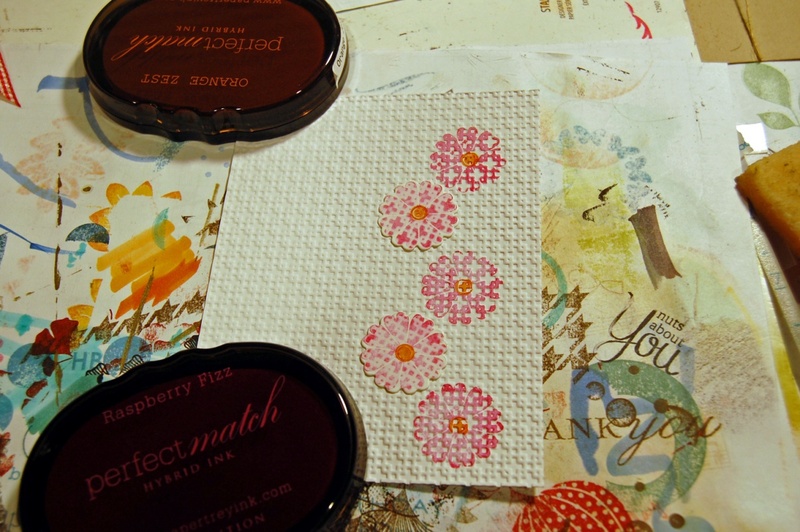 I stumbled upon this technique while I was making “love you” cards for Operation Write Home. 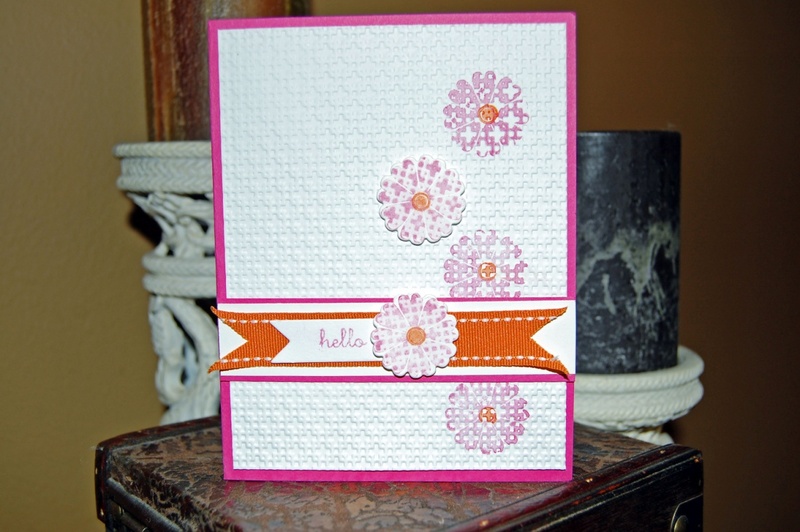 I was trying to design a simple card that novice stampers could do but it was looking rather plain. For “round 2” I added a textured background. 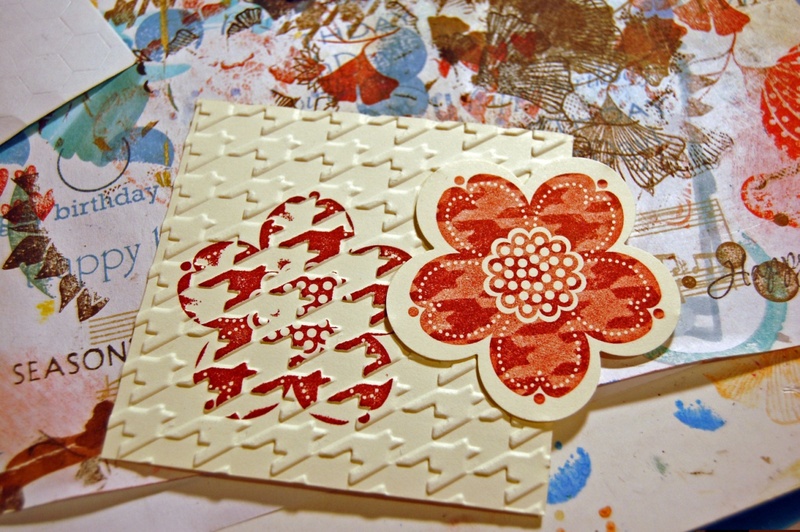 Then I stamped on the embossed background in “round 3”. By the time I got to round 4 I realized I had a pretty cool “kissing” technique … one I could actually do, because most of the time, I get so-so results. 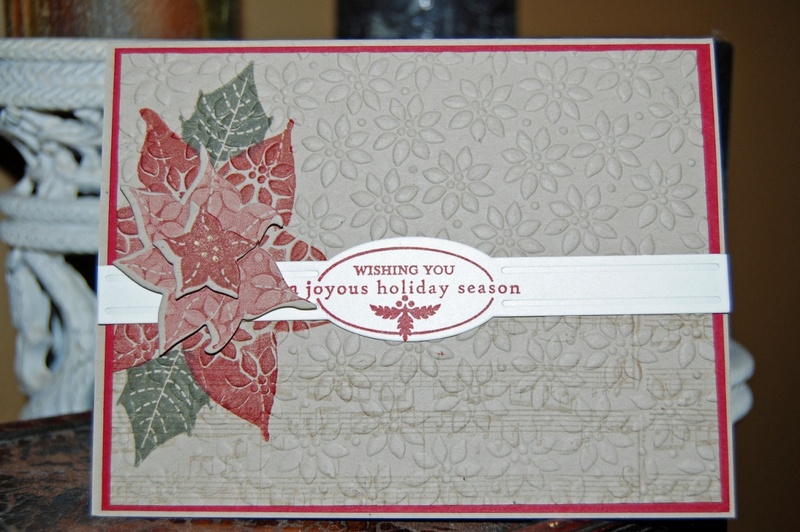 To start with cut your layer to size and run it through your die cut machine to emboss the pattern. 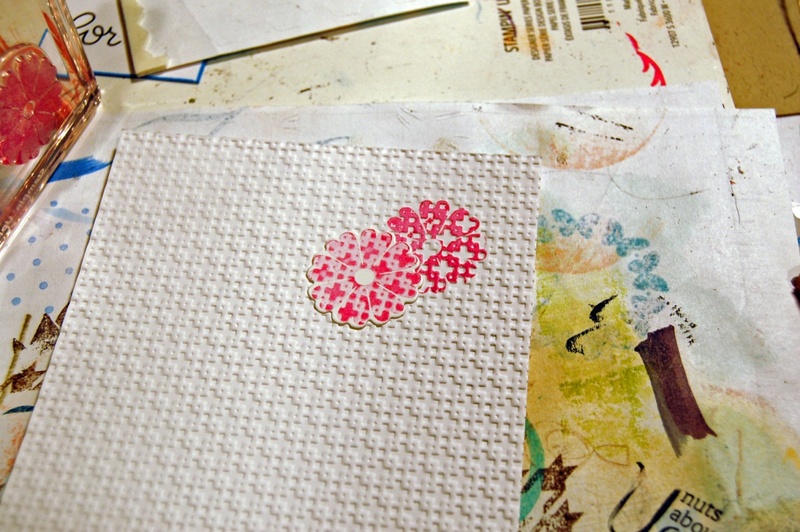 Without re-inking, stamp the image onto a scrap piece of card stock. Here is the scrap I embossed and used as my kissing pattern (that sounds weird 🙂 ) along with the punched final image. I love how the hounds tooth pattern showed up on this! Thanks so much again, Maureen, for putting this tutorial together for us! I know people will be excited to give it a try. Everyone, remember, if you have suggestions for tutorials, please contact me at kate@operationwritehome.org. Maureen, Terrific tutorial. Thanks so much for sharing. I will be trying that very soon. Thank you for the fantastic tutorial! It looks like a fun and easy technique. I can't wait to try it! What ink is good to use for the Kissing Technique? What do you mean by "rinse and repeat? What do you do with the image you stamped on the cardstock? I am not seeing this in my mind's eye. I loved your card when I first saw it and wondered exactly how you got the effect you did. Thanks for sharing this technique Maureen! Wow… this is a great technique. Thanks very much for sharing. Going to try this over the weekend for sure! Thanks for sharing! 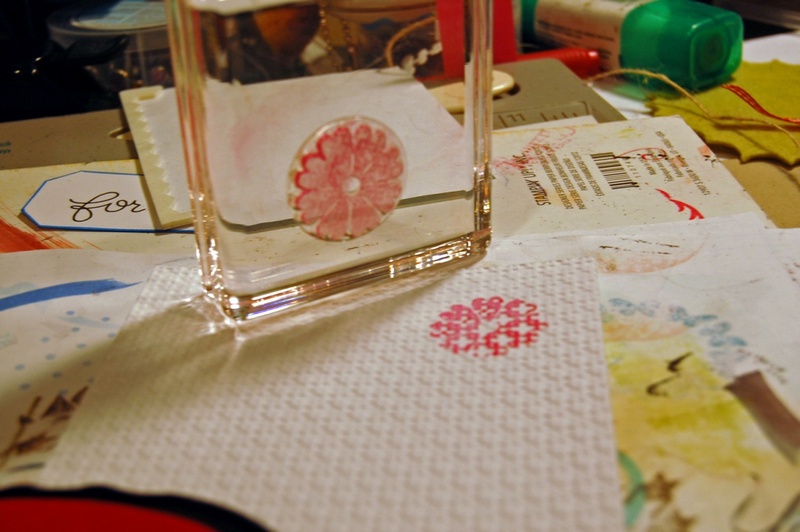 "Rinse and Repeat" is my dorky way of saying, clean the stamp off and re-ink and stamp again. 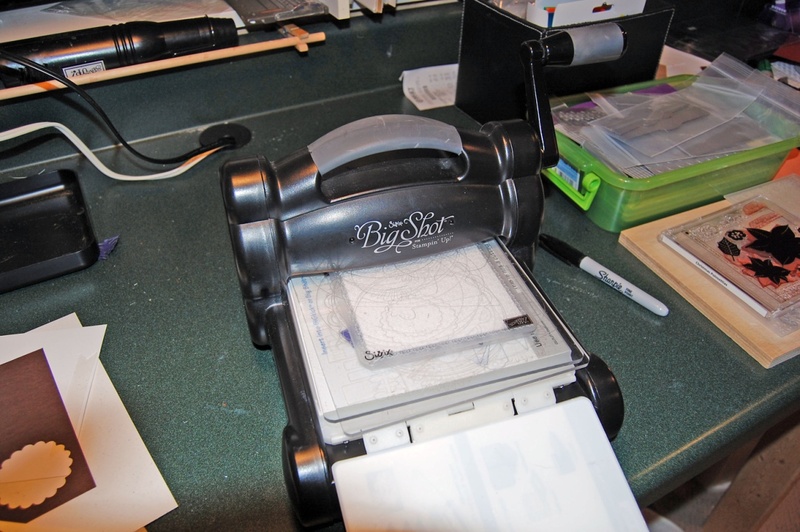 When you stamp the second time on cardstock, you can cut it out, punch it if you have a matching punch or just use that as the layer on your project. When I wasn't using the embossed image in the project, I just saved it so I could use it again. 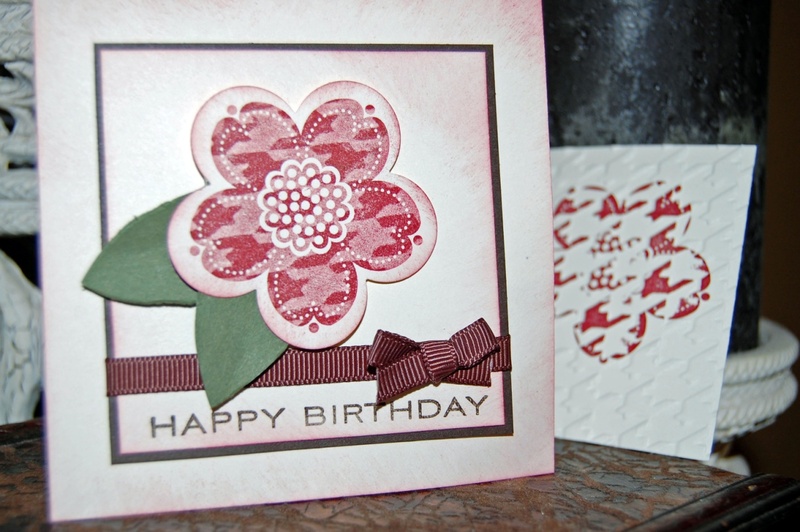 I plan on making more of those houndstooth flower birthday cards! This is so cool! I can't wait to try it–but I guess it will take me a few days to do so becuase of the holiday! Thank you so much for sharing your talent and skills! Thanks. That makes sense to me now. I can't wait to get a few minutes to try this. I have lots of stamps that have dies to match.